... 1986, U.S. President Ronald Reagan declined to comment on a report that the "United States sent military spare parts to Iran as part of a secret operation intended to gain the release of American hostages in Lebanon." Two days later Congress announced plans to investigate whether the administration "had used the White House staff to circumvent Congressional restrictions on foreign policy and covert operations." On November 13 Reagan would admit that aid had been earmarked for Iran, then at war with Iraq. But soon it was revealed that NSC official Oliver North had diverted a chunk of the funds to the anti-government rebels in Nicaragua. 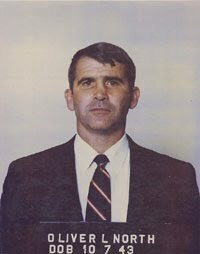 (credit for North's mugshot) The Iran-Contra scandal grabbed headlines for years thereafter.